EMBROIDER THIS... specializes in quality custom embroidery and monogramming. We can digitize your logo or design, or you can choose from our extensive library of artwork. Customize the look by adding your company name and/or a message in your choice of type styles and colors. 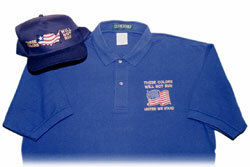 Quality custom embroidery can be a real identity builder for your business. All embroidery is done in our shop in Wharton (Lake Shawnee), New Jersey, by highly-skilled embroiderers. Established in 1994, our company has been continuously expanding ever since to meet the growing needs of our customers. We give each job, large or small, the personal attention it deserves. Many of our customers have discovered that a custom-embroidered item, such as a baby blanket or a cozy robe, makes a great gift. Other customers come to us for team sportswear or company uniforms. No job is too large or too small for us, and we never set minimum quantities. We adjust our prices to accommodate any size order, from one to thousands. Choose your clothing and accessories from our online catalog, where you can select just the garment or garments you're looking for from our huge collection of clothing in all styles, fabrics and colors. Or, if you'd like to add a custom touch to your own garments, you can bring them to us instead. Our normal turnaround time is two weeks or less. However, we realize that not all orders can wait two weeks, and we are happy to provide expedited service when you require it. EMBROIDER THIS... is able to handle your job from start to finish. We can supply the garments for you, digitize your logo, and can even drop ship to your customer. EMBROIDER THIS... is your one-stop shop!